For the third week in a row, the RPScore Top 5 looks exactly the same. While some teams have managed to take leads in their division thanks to luck and/or timing, the three best teams today are the same as the three best teams a month ago. Who's been good? Who's been lucky? Who are the big movers and shakers? Who will be on top when it's all said and done? Keep reading to find out. I added three new columns to the RPScore Ratings page: L7, L30 and Luck. L7 is each team's performance over the past seven days. L30, as you can surmise, is each team's performance over the past 30 days. Luck is the difference between each team's actual record and their expected record based on RPScore (with some adjustments; check out the page for details). On the RPScore Ratings page I also describe how I've been adjusting each team's 2nd degree win rate (and, by derivation, each team's 3rd degree win rate, Xth degree win rate and RPScore) using a "decay factor" that overweights more recent results and underweights older results. I've been doing this from the start of the 2018 season. So there's no drama at the top tier. Who are the biggest movers and shakers to-date? The Tampa Bay Rays have come on strong this past week, jumping five spots as they improved by 17 points. Over the last month, the Phillies have shot up six spots while adding 31 points to their RPScore. In contrast, the Minnesota Twins have only fallen one spot after shedding 16 points off their RPScore. Shockingly, we see the Diamondbacks falling 11 spots and shedding a whopping 79 points from their estimated true record. And what is there to say about luck in baseball this season? The Mariners have the fifth best record in baseball this year, but they're punching well above their weight. By about 52 points, they're the luckiest team in the league right now. 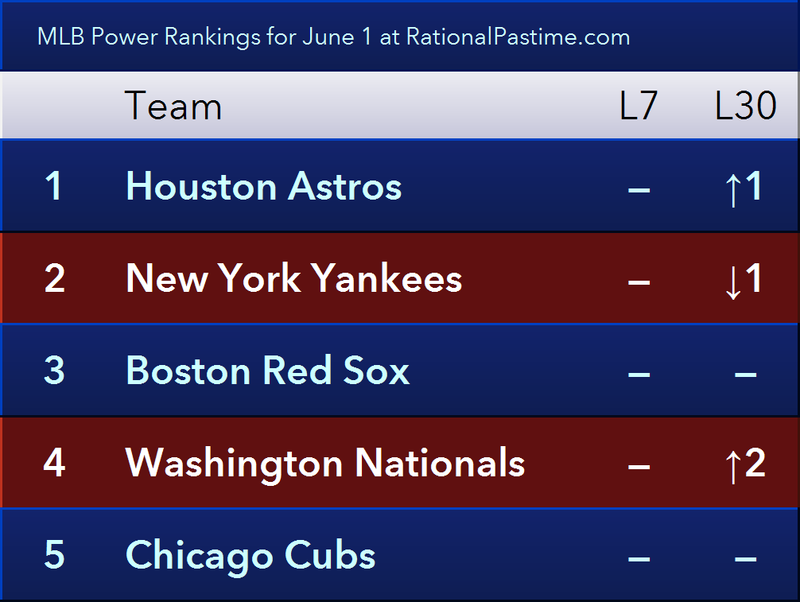 The Astros have the fourth best record. By all rights, they should have the best record, and it shouldn't even be that close. Houston is punching about 62 points below its weight so far this year. What other information can you convey that provides me absolutely no insight into the game or the world at large? The 17 runs the Brewers tagged the New York Mets with on May 26 might not be the most scored by a single team in a single game this year, but the 16.3 Base Runs they accumulated were. Finally, a team hit three triples in a game. The Pittsburgh Pirates did it to the St. Louis Cardinals on May 25. Those same Cardinals have only hit two triples all season. The Red Sox still project to win 100+ and still project to need a play-in win to reach the ALDS. The casting for the role of Boston's speed bump has changed, however, with an 88-win Mariners now playing the potential spoiler. The Yankees have yet to be shut out this season. The Toronto Blue Jays have yet to shut anyone out this season. The Twins and Miami Marlins are the only teams not to plate 10+ this year. The Diamondbacks and Cardinals are the only teams yet to allow 10+ this year. The Red Sox lead baseball in producing runs, hits, doubles, total bases and at bats. The Rangers trail the rest of baseball in allowing runs, hits, doubles, total bases and at bats. The home team has won 50.5% of its games this year with a run differential of -6.